Osborne Industries is pleased to announce the development and release of a new hopper extension for their FIRE® (Feed Intake Recording Equipment) pig performance testing feeder. The extension fastens to the top of the feed hopper, increasing the feed capacity by approximately 75 lbs (34 kg). The FIRE hopper extension is made of corrosion-resistant, molded polyethylene and features an acrylic window on one side so visual confirmation of the feed level in the hopper can be observed. A removable lid is also available to help keep feed clean, fresh and palatable. The extension kit bolts to the feed hopper with existing fasteners and works with any of the model MK3 FIRE Feeders. Known around the world as the “gold standard” in pig performance testing, FIRE continues to lead the industry as the most reliable ad-libitum performance testing feeder. With outstanding accuracy, FIRE completely automates the measurement of individual daily feed intake and other performance characteristics of growing animals. FIRE helps identify the most efficient and superior animals for improving herd genetics, and is currently used by more genetics companies than any other system in the world. FIRE Feeders have been successfully used to test the performance of pigs, sheep, and goats. 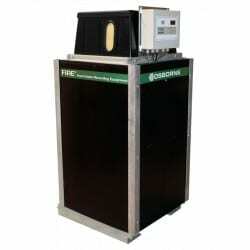 For more information on the FIRE pig performance testing system, click here or e-mail info@osborne-ind.com.